The HPX6000 Professional DJ Headphones by Behringer are a pair of circumaural closed-back headphones that feature 50mm drivers and a frequency response range of 15Hz- 20kHz. The headband and ear-cups are adjustable and can be worn on the head or around the neck single-cup style. Each ear-cup has a large leather cushioned ear- pad for long wearing comfort. The ear-pads cover and seal the ears for audio isolation and noise cancellation. 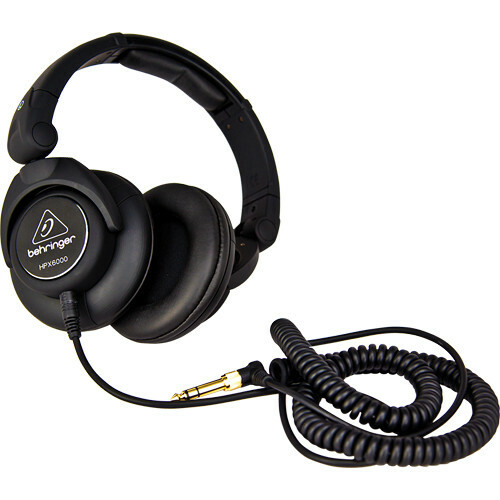 The headphones are foldable and the single-sided detachable cable allows for easy replacement. A 1/8” gold-plated adapter is included that screws on to the 1/4” connector at the end of the cable. The 1/4” adapter allows you to connect to devices that have a 1/8” plug such as mixers, controllers, amps and more. Note:I took out features because they were repetitive. The necessary information is in the description and specs. Box Dimensions (LxWxH) 10.6 x 8.6 x 4.5"
HPX6000 Professional DJ Headphones is rated 4.3 out of 5 by 4. Rated 5 out of 5 by Gordon from Pretty good inexpensive headphones with some low end. I have two other pair of headphones, but I was noticing lots of the bass in modern music wasn't coming thru, so I thought i would try these ones out, and the bass response is much better without being bass heavy. The cable unplugs which is nice, but currently they don'y have any shorter options available. Hopefully someday they make a shorter non-coiled version cable available then I could use them as my video recording headphones also. But for now they are great for just jamming to music. Rated 4 out of 5 by Recording_Live_Audio Guy from Pleasantly surprised! These really aren't bad headphones. When a friend of mine suggested them to me I was a bit hesitant, but honestly they're absolutely useable. They have a low-end bump that most people will appreciate and can take high SPL. I wouldn't mix a record with these but for 90% of applications these are just as comparable to 7506's, HD280's, and many other well known cans. Rated 3 out of 5 by Coffee-Brake from DJ ? - Maybe!... Professional Use ??? Use - is Sound! Delivery - poor.Ones again - maybe for DJ Monitor +- But not to trace the frequencies !!! If I want to get an extra shorter non-coiled detachable cable for these headphones, do I need a special one or will any generic one work? There is a swivel tab on the cord connector that locks it in place where it meets the headset. Failure to use an authentic cord could result in accidental disconnection during use. I recommend contacting the manufacturer directly.